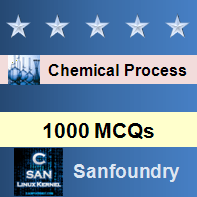 This set of Chemical Process Calculation Multiple Choice Questions & Answers (MCQs) focuses on “Stoichiometry-III”. 1. How many CaSO4 in kg is required for producing 1 mole of Na2SO4? Assume NaCl in excess. Explanation: 1 mole of CaSO4 = 1 mole of Na2SO4. 2. How many kg of Na2SO4 will be produced using 80 kg of NaCl? Assume CaSO4 in excess. Explanation: 2 mole of NaCl = 1 mole of Na2SO4. 3. How many moles of CaCl2 will be produced using 300 kg of CaSO4? Assume NaCl in excess. Explanation: 1 mole of CaCl2 = 1 mole of CaSO4. 4. How many pounds of NaCl required producing 2.5 pound moles of Na2SO4? Assume CaSO4 in excess. Explanation: 2 pound mole of NaCl = 1 pound mole of Na2SO4. 5. 1/A pound moles of CaSO4 are used to produce 222 kg of CaCl2. What is the value of A? Assume NaCl in excess. Explanation: 1 pound mole of CaSO4 = 1 pound mole of CaCl2. 6. When 32gms of CH4 is burned with excess oxygen, how many grams of CO2 are produced? Explanation: 1 gram mole of CH4 = 1 gm mole of CO2. 7. How many grams of C2H6 are required to produce 88 grams of CO2 when it is burned in the excess of oxygen? Explanation: 1 gram mole of C2H6 = 2 gram moles of CO2. Explanation: Number of each element is equal on both sides. 9. For producing 4 gram moles of HNO3, how many grams of NO2 are required? Explanation: 3 gram mole of NO2 = 2 gram moles of HNO3. 10. If the NO2 in the feed is 400 gms, How many moles HNO3 will be in the product?